Another dish done in the “Paellera”. 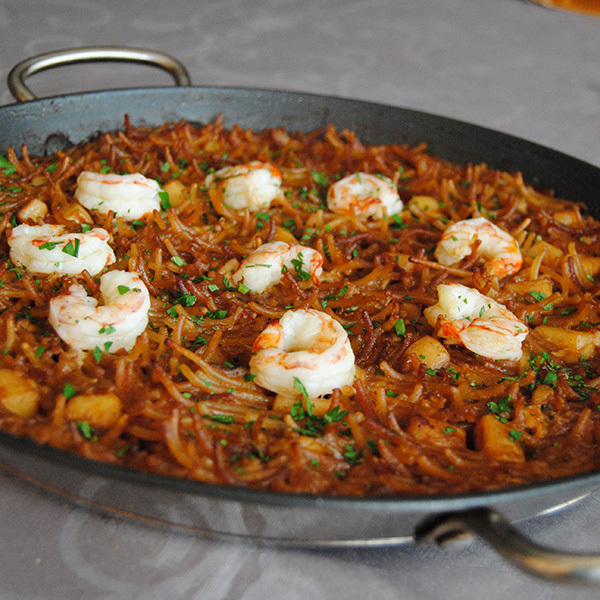 The famous Fideuà (Noodle Paella) or Fideuada. 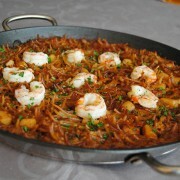 From the city of Gandia, this dish is absolutely amazing and so simple to prepare. Basic ingredients and patience as good food demands!!! Serve it always with allioli. Add the sunflower oil in the Paellera and fry the noodles until golden. Don’t overcook it or then they are not going to hydrate. Put aside. 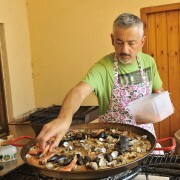 Add more oil, now extra virgin olive oil, in the Paellera and fry shortly the prawns and put aside. Fry the garlic cloves until golden brown and the cayenne chili. Remove the chili and put aside the garlic. Fry shortly the cuttlefish and put aside. We want it soft and tender. Add the onion in brunoise and poach until soft and transparent. Add the chopped tomato and sautè all together. Add the fried garlic chopped. That’s a lot of flavour that I don’t want to loose. 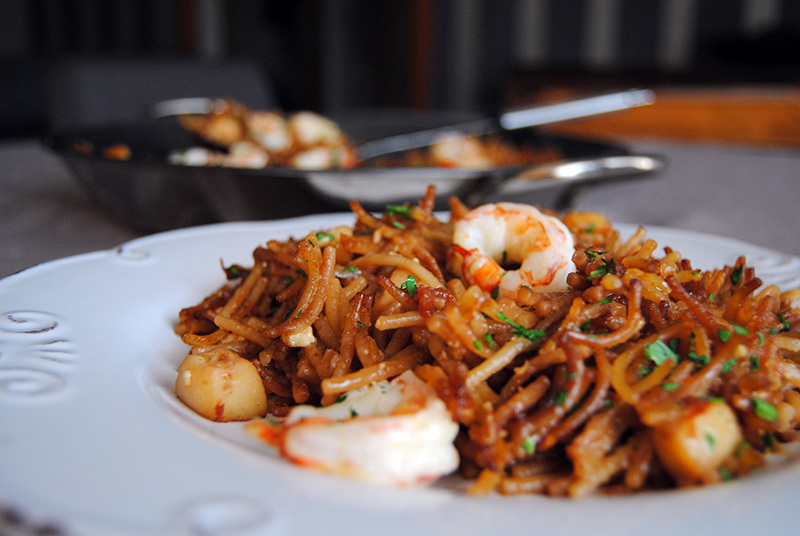 When golden add the noodles, the cuttlefish and stir it to mix all the ingredients. Add the hot fish stock covering the noodles. Stir it all and let the noodles “drink” all the stock. Add the prawns just a couple of minutes before finishing the cooking. The noodles must finish “erected”. That’s a good signal. Spread some fine chopped parsley on top to decorate. 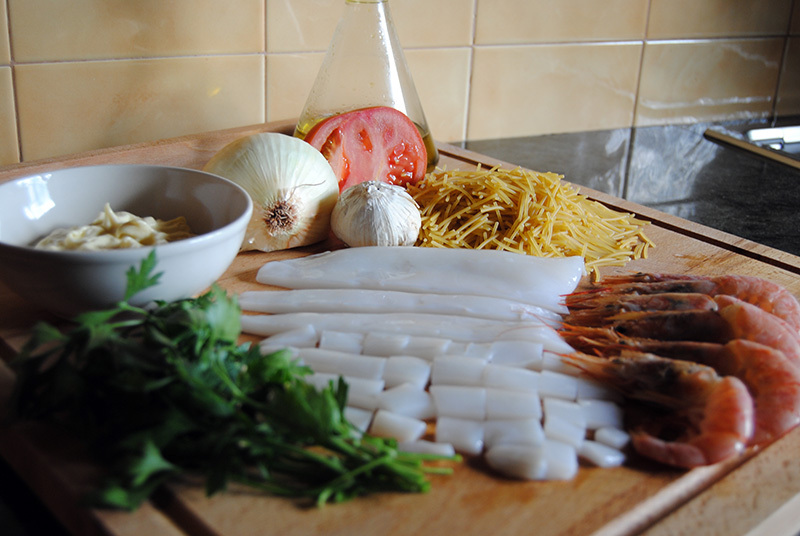 To improve the global taste, I add a spoon of allioli when I add the fish stock. Learned from David, my brother in law, a great chef!!! Fig jam and chocolate sticky buns Salimos en el Marie Claire de Reino Unido… Bazinga!!!! !